I want my camera to following behind the player at all times. When the player turns to the left, I would expect the camera would move behind the player while remaining focused on the player. My camera stays focused on the player. However, it does not rotate to stay behind the player. I tried following the directions from here, and here. Neither of which seems to help. I have done something a little different, per instructions from a online unity class. My main camera is a subobject of a rootobject, as shown in this picture. 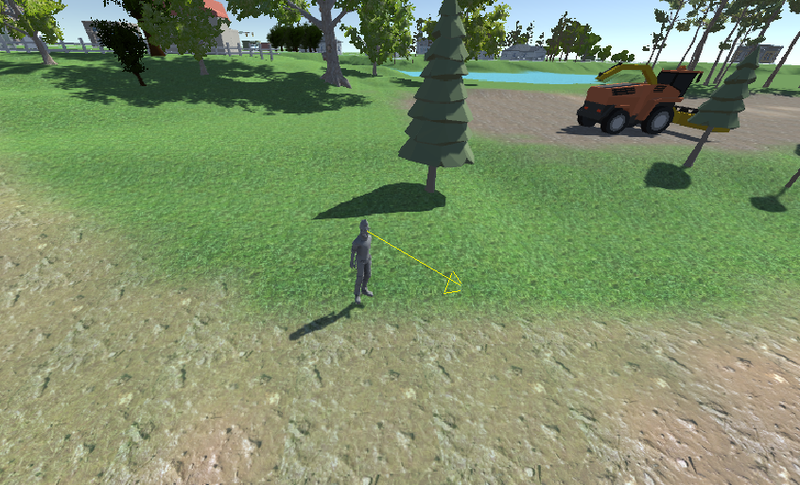 I have attached image of the game with the yellow line showing which way the player is facing. The camera is facing in a different direction. Follow-up from answers: I cannot get either solution to work. @alejandrodlsp solution doesn't compile (I've added a comment to the answer explaining why). If I do not set offset on Start (aka its always 0), then the camera rotates. The problem is that is at the feet the player and not behind like I wanted. Once I compute offset, then the camera never rotates behind the player. I would separate the following and rotating functionalities into different functions, and call them both from the fixed Update for the purpose of clarity. I'd also set the follow movement for the parent object and Slerp to the same rotation as the player's; no need to use the transform.LookAt() function. Another option may be to set the camera system to be a child of the player itself, but that path rules out any type of movement smoothing. I hope this is useful for you and fixes your problem. I have a solution to what I needed. I appreciate everyone's input. The solution was definitely "outside the box". The key to the solution is this property [gameobject].transform.forward. My other change was to use LateUpdate() as it is called once per frame, rather than FixedUpdate(), since that's called during the physics phase. [gameobject].transform.forward gives the direction the player is looking at. Obviously, when the player rotates, the vector rotates too. For more info, see this post. // by getting the distance between the player's position and camera arm 's position. // compute camera arm location. Thnx again. Everyone's help is appreciated. I wouldn't have been able to think through the problem enough without it. Not the answer you're looking for? 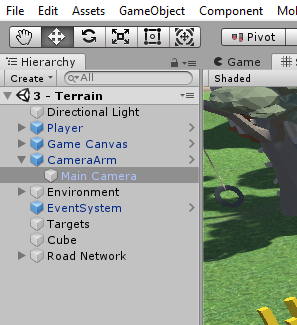 Browse other questions tagged unity c# camera open-world or ask your own question. How to rotate camera counterclockwise around player?